Love, Christin | A Lifestyle Momprenuer Blog: It is Monday Isn't it?! .It is Monday Isn't it?! It doesn't really feel like a Monday but it is! Happy New Year's Yall!! 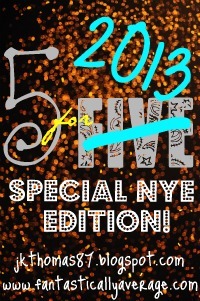 So it's that time again but instead of doing the usual 5 for Five, this week it's our 5goals for 2013! are hosting a New Year's Eve edition of their link up! 1. Workout at Least 3 times! LOL, I didn't even bother. It was my lazy weekend! 4. Go grocery shopping with my cut out coupons ! OK so I haven't done much of my goals that I posted, but I went to work, had a lazy weekend, chilled with family<3 and paid my bills! I did do something! I am determined to do this this week! anyone have a good website preference? 2. WORK OUT AND GET BACK TO MY PRE-BABY BODY! I know its so cliche so have this goal but I am determined!! I have to! YES I know it's possibly the worst habit I could possibly have! and I am determined to quit! Even if I have to pay to take medications LOL I have to quit for my health, and most def. for my son! In my situation It's kind of hard to do this..the job part.. but I can't move out OR save money without getting a raise or finding a better job. So I need to go to school and get started with the "process"
currently my car is broke down across the street. I am using my Stepdad's car ... THANKFUL FOR MY FAMILY!.. until I get a new car. But as the process goes, I can't get a new car without saving money which goes back to going to school and getting a better job! & since I have your attention I wanted to tell you a little bit about things going on at home, Josiah my (just turned) three year old, has just got off the pacifier ! So during the middle of the night he wakes up and starts screaming. He lays down - puts his finger in his mouth and goes right back to sleep! Does anyone have any advice on this situation?! FINGER SUCKING?!? I admit I might have taken the pacifier away too quick.. BUT it was time!!! Who can agree?! He already is so spoiled, with sleeping with me or my mom, still getting his hot cup of milk in the morning and at night, and always, I MEAN ALWAYS leaving the store with something in his hand.... (well that only happens with nana) But anywho... What is some of your advice for spoiled 3 yr olds trantrums and all that good stuff? recommend any goods bloggers? This blog post is a must see on New Year's Resolutions, Why we fail? && What we need to do to succeed them! Aww, best wishes on your goals for 2013! I definitely want to set a budget plan, too. Something's gotta give, our finances have been out of control the past year! Good luck on your goals for the year ahead! I know, I know, I KNOW you can do it!!! I really need to work on my budget this year- too much frivolous spending happened in 2012. I want to get a good hold on my credit cards and savings!You have some other great goals, too! I know that you can do it! Thanks for linking up with us! Hi Christin...new follower her! I feel you on #3. I am (was) a social smoker. I have been cigarette free for 11 days (on day 12 now). I've been wanting to quit for a long long time. I went home for Christmas and got sick with an upper respiratory infection. I feel like it's from sneaking those cigarettes at work out in the cold. So, I am going with it and detirmined to not smoke again. YOU CAN DO IT!